Free time for Tamara is spent outdoors hiking in the woods or strolling around the neighborhood with her husband. She also likes participating in group yoga classes and immersing herself in different worlds through reading. Tamara is a theoretical physicist who studies some of the largest black holes in our universe, known as supermassive black holes. She investigates observational signatures associated with the interactions these supermassive black holes have with gas and stars. 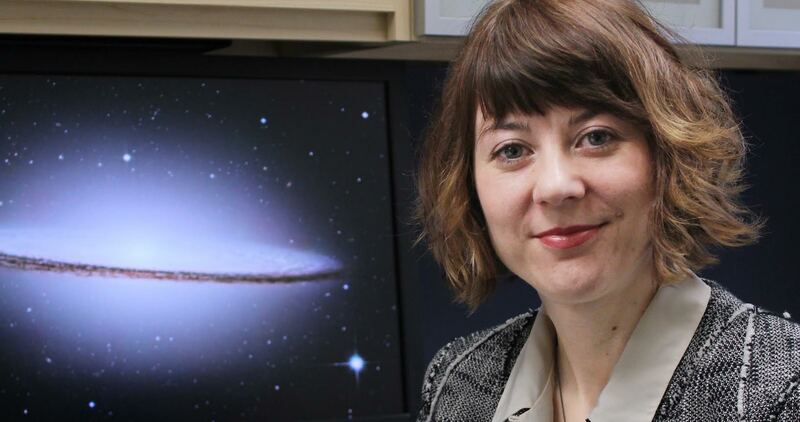 Her group works to develop theoretical models to predict signatures of supermassive black hole interactions that can potentially be identified in observational astronomical data. Growing up in a small town in Serbia, Tamara had a wide variety of early career aspirations, spanning from ballerina to architect. She recognized early on that she enjoyed solving challenging problems, but it wasn’t until high school that she became aware of astrophysics as a potential career field. Astrophysics was appealing because it incorporated challenging problems, the adventure of discovery, and many of the elements she enjoyed about math and physics. Though there were points where others questioned her career choice, but Tamara’s family was very supportive, and she knew this was the kind of work she wanted to do. When Tamara started applying for faculty positions in a variety of countries, the astronomy job market was grim. The onset of the global economic crisis resulted in many institutions initiating a faculty hiring freeze, which meant the few highly competitive positions in her small field became even more competitive. She was also faced with trying to find a place where she and her husband (also a scientist) could both find jobs, the need to maintain employment to be allowed to stay in the country, and that nagging voice of her high school teacher telling her she should have pursued engineering instead. A very important component of an early faculty member’s job is to assemble a laboratory and a team of students, postdocs, and/or staff members who can quickly get up to speed and start making important contributions to the field. About a year or two ago, Tamara’s research group reached this threshold, and they have begun making important contributions to various research topics. This was really rewarding, and it was also exciting to have her research efforts recognized this year through receipt of the Cottrell Scholar Award and Cullen Peck Fellowship. In 2010, Tamara traveled with her now-husband to the Meeting of the American Astronomical Society in Hawaii. Tamara enjoyed presenting her research and re-connecting with colleagues. In addition, she and her fiancé decided a week before the conference to get married in Hawaii while they were there, and they had a beautiful small ceremony on the beach. After this trip, they traveled to different cities to celebrate the momentous occasion with friends and family all over the world. A group of astrophysics faculty members at Georgia Tech started a tradition of holding a series called “Faculty on the Hot Seat” where faculty members candidly answer questions from students, postdocs, and other faculty in the audience. The questions can be about their research or their lives in general. It is a fun and funny way to get to know each other and show students a different side of their teachers and mentors. Always look on the bright side of life. There will inevitably be times when things don’t go your way. With a lot of patience, belief in yourself, and a pinch of luck, you can make it through anything. Tamara Bogdanović is a theoretical astrophysicist whose research interests include the ins and outs of some of the most massive black holes in the universe known as supermassive black holes. She investigates the physical processes that arise in accretion flows around supermassive black holes and uses them as luminous tracers of these otherwise dark objects. Some of the scenarios she and her colleagues study include the accretion of gas by the single and binary supermassive black holes as well as the accretion of stars that happen to be disrupted by the black hole tides in galactic nuclei. Tamara’s goal as a theorist is to predict the signatures of these interactions which can be searched for in observations, as well as to provide interpretation for some of the puzzling astrophysical events seen on the sky.